Browse: Home / D0xk1t ~ Web-based OSINT and active reconaissance suite. D0xk1t ~ Web-based OSINT and active reconaissance suite. 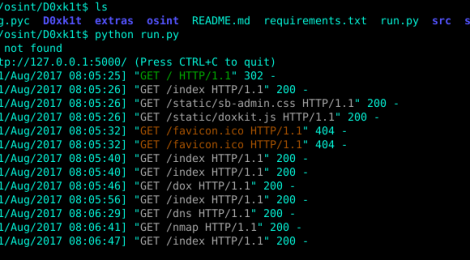 D0xk1t is an open-source, self-hosted and easy to use OSINT and active reconaissance web application for penetration testers. Based off of the prior command-line script, D0xk1t is now fully capable of conducting reconaissance and penetration testing for security researchers who need a framework without the head-scratching. + Is this a website / webapp ? Yes and no. In essence, it is not a typical website. D0xk1t is self-hosted. There is no server stack, cloud-based service, SaaS, etc. that is holding it up. You can have the option of deploying D0xk1t on a local network, or deploying your own instance on any infrastructure / technology as you wish (although not recommended). + Is this free ? Yes. D0xk1t will forever be open-source. If you wish to contribute, you can make a fork, add any changes, and send a pull request on Github. Open config.py. Here, you will see all the environmental variables that the application utilizes. Three important fields you MUST be aware of if you plan to deploy to the web. ← Jlsca – side-channel attack toolkit.